Two documents, a marriage certificate and photograph have been passed down to the children of the couple featured in this the third in the 50 Marriage Mondays series. The location is recorded as “The Parish Church”, Handsworth. As there were several parishes in Handsworth, which church does this mean? The Marriage Acts 1811-1934 are quoted. Why not the later Marriage Act of 1939? A search on the FreeBMD [link] index for this marriage (Vol 6d, page 635) suggests that the registration district was Birmingham. Registration districts, introduced from 1837, were initially based on the Poor Law Unions, but often modified later to reflect re-organisations of local government. A Vision of Britain contains comprehensive data on jurisdictional changes, and Genuki has helpful summaries . In 1940, Handsworth civil parish was part of Birmingham Registration district. The most likely candidate for the parish church in Handsworth is St Mary, an ancient church and parish. Other ecclesiastical parishes established in Handsworth were St James (1854), St Michael (1861), St Peter (1907) and St Andrew (1914). A couple more current churches are listed on The Church of England (the established church). The stone built church depicted in the wedding photograph features crenulations. Using Google Map’s streetview I found that St Marys is the only one that matches. 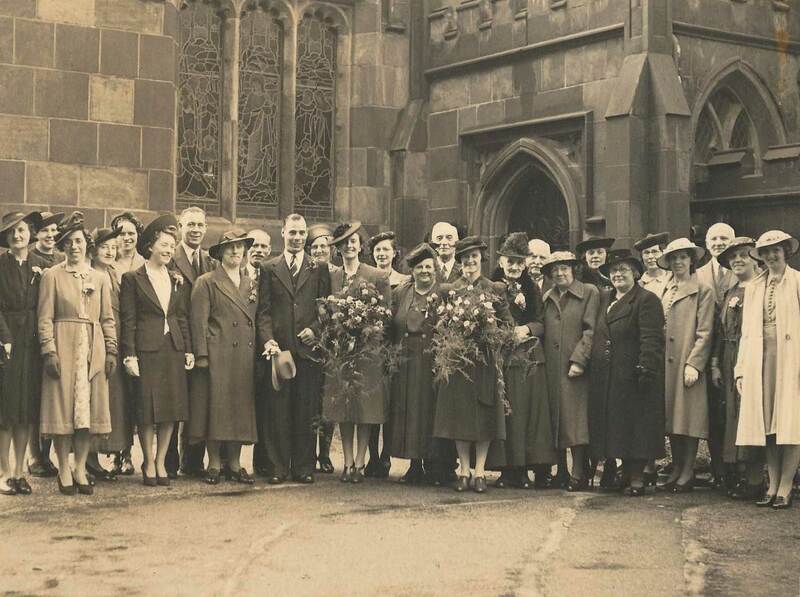 The Marriage Act 1939 was concerned with marriages where one party who resided in Scotland and the other in England. So, it may not have applied to this particular marriage. I do not know if a new form of certificate was produced as a consequence of the legislation, but I speculate that in 1940, World War II took precedence over printing new legal stationary. With special thanks to Paul and Pat Round for sharing the certificate and photo.